Here are a couple of better photos showing the green coloration of the stripe... 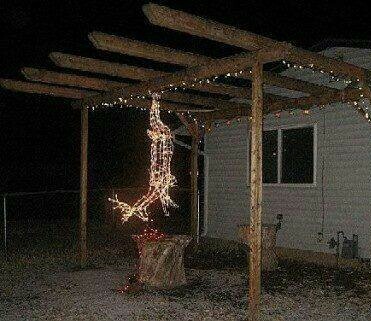 Still not as bright as it actually is. Here is what I am talking about with the shelf. This is a photo of a brand new gray maple riser. Pretty much the same height and shape as on most of my other take downs. Here is the shelf on the old Green Stripe. It is actually about 3/8" lower and narrower than the rest of my take downs. When you put an arrow on the shelf with out the rest, it is actually laying on your finger. 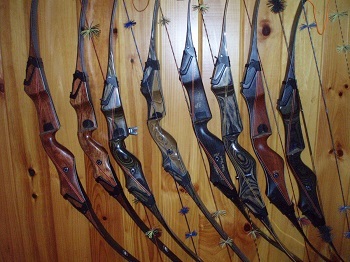 Like I said, the arm on the rubber rest is about the same height above your hand as the shelf is on the other bows. During the middle of the day today I spent an hour or two messing around with this new green stripe. I tried shooting it off of the Bear weather rest, but that just didn't work out for me. Everything I tried to shoot hit 12 inches to the left. I guess I hadn't paid much attention to how thick those things were. It really moves your center shot out quite a bit. I figured that by setting it up to shoot off of the shelf it would make the bow more center shot, moving the impact point to the right and making it more user friendly to various arrow spines. Well, that did exactly what I had hoped for. Groups are centered in the target now and a 60-65 pound douglas fir flies like a laser. I have to say though that it is going to take a little getting used to that Fred Bear grip and having the arrow sitting so low on the shelf. You have to be careful when gripping the bow to not lift the arrow off of the shelf slightly as the arrow actually rests on your hand. 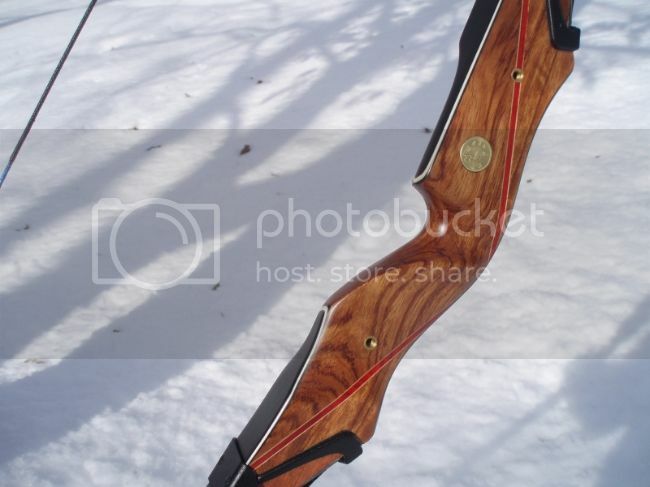 I put a little bit of leather under the rest material it raise it up some but the arrow still sits right on your hand. It is probably going to work out great for instinctive shooting but you definitely want to make sure that you trim the ends of your fletching or it will rip you hand open. can you add thicker rug material? Yeah, that's pretty easy to do. 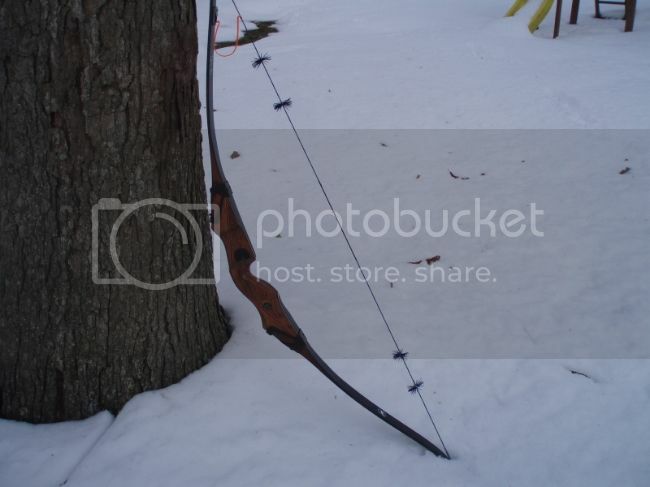 Just in the messing around stage with this bow right now. I did lift the rug and put a narrow but thick piece of leather under the rug. The photo I posted is actually after I raised the arrow a little bit. Well.... I picked up another Bear takedown last week. Big Jim ran an incredible sale. Apparently Bear Archery has discontinued the Bubinga riser as it is time to move on to the 2014 Bubinga/black diamondwood riser. Big Jim bought out all of their existing stock of Bubinga risers and limbs and offered them at a great price....about $250.00 below normal cost! There were only twelve risers in the deal and I was lucky enough to be able to jump on one of the A's. I got it in last week and due to our weather, have only been able to shoot it at the indoor range but so far, it is really impressing me. A little heavy to shoot too many 300 rounds with indoors but I have every expectation that it will get bloody this coming fall. 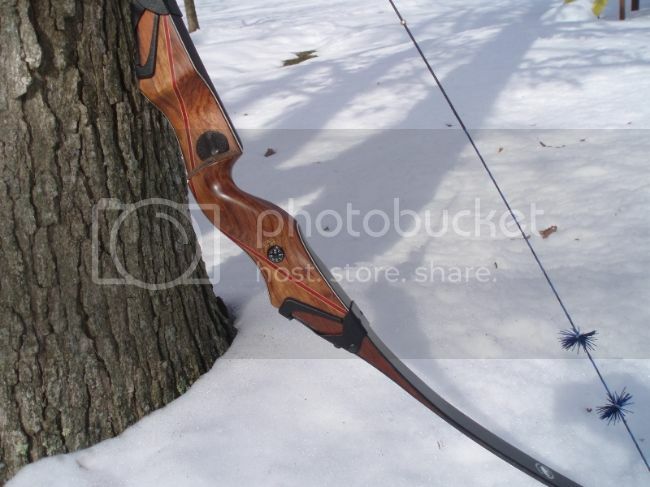 This one is an "A" riser with #3 limbs to make a 60" bow. It is 61 pounds at my draw length. They are putting some really pretty Bubinga in these risers. A thing of beauty and a joy forever. a lot during indoors and between seasons. I think these two toned risers are my favorite of the T/D clan. You need a Signature Gold Latch.Let's talk.